Tools like automated recurring billing are vital for organizations needing to submit multiple payments to suppliers across various jurisdictions – which is why there are plenty of secure and convenient digital payment solutions designed around online invoicing and recurring billing functionality. 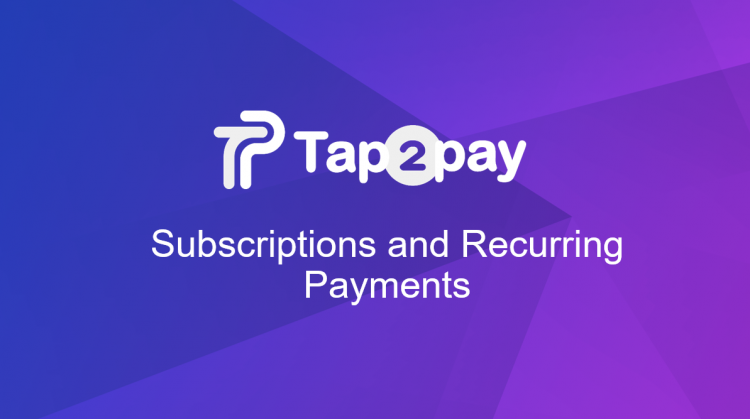 As you know Recurring payments and Subscription available In Tap2Pay. let’s find out how it works and what are the advantages for sellers and buyers. Recurring billing is when a merchant automatically charges a cardholder for goods or services on a prearranged schedule after he makes an initial payment. Recurring billing requires the cardholder’s permission one time up front for recurring charges, then continues with scheduled charges until the cardholder unsubscribe. Recurring payments allow businesses to accept credit card payments for any type of content subscriptions, newsletter fees, SaaS products billed periodically or recurring donations. The recurring revenue model has been favored by industries such as insurance, utilities, mobile operators, retail, food delivery, TV, music, game streaming, fitness and beauty industries, cooking, dating, online gaming, online gambling etc. Flexible, automatic, time-saving billing frees you from invoicing for each individual payment. It’s a guarantee that you receive payments on time. It helps with customer retention, you can build strong relations with your customers. Your customers can subscribe to multiple plans simultaneously, it increases conversion. It allows customers to save money, time and energy and often they have a great sense of appeal to them because it means access to exclusive memberships and communities. The whole process needs to be initiated by the first sale or card authorization. After that, all future payments are done automatically. A customer visits your website and selects the recurring payment option (for instance, you can charge your customer monthly, but give them an option to choose basic or premium account). Then he accepts the terms and conditions and waits for authorization. The last step is to enter card details and confirm the payment. For now, your customer is charged automatically on a certain period. After every charge, you’ll see all transaction in your dashboard. And the customer will receive notification about money charged. 1. Create a new product. For that go to Product Tab, +Add New Product. Аill in the details about the product: price, description, add an image. You can add custom fields that will be on checkout widget. You can write an email comment. 2. After that select Recurring. Select which intervals you want to charge the customer for that set the billing cycle: day, week, month, year, minute. 3. After that integrate button on your site follows the instruction. 4. Through API you can set up logic to automatically retry failed payments deciding how many times the system will try to receive the payment, such as retrying 1 day after the attempt or stop the charge even when the first attempt is failed. You can set up upgrade and downgrade subscriptions. Provide various pricing tiers and flexible billing periods. You can offer subscribers a trial period, special introductory rates, and a regular rate. After every charge, you’ll see all transaction in the Tap2Pay dashboard in the Subscriptions Tab. With all those benefits, it’s possible to process payments from customers on any device. You can easily offer subscription plans according to your customer’s needs, improving their buying experience. Ready to activate recurring payments and subscriptions on all digital channels: site, social and messengers? Just log in to Tap2Pay site or contact us anna@tap2pay.me if you have any questions.